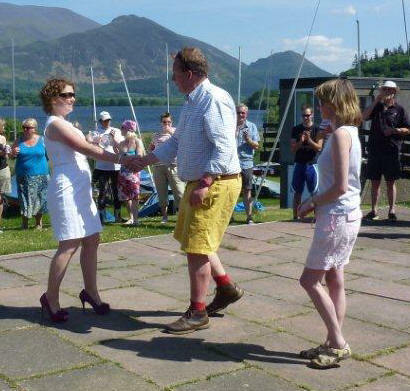 Eleven visitors joined five boats from the home club to contest the Waples Wine Flying Fifteen Open at Basssenthwaite SC on the weekend of May 26/27. The forecast ‘champagne conditions’ materialised with unbroken sunshine being complemented by a strong, warm breeze from the SE. 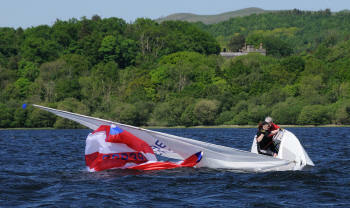 Some were daunted by the apparent strength of the breeze prior to launching, some only after they had launched. Broaches were relatively commonplace even at the front end of the fleet, whilst becoming positively ‘de rigeur’ at the opposite end. The Race Officer had elected to sail three races back to back on the opening day. Unsurprisingly, perhaps, Steve Goacher and Phil Evans from RWYC showed a mastery of the conditions causing one spectator to comment ‘poetry in motion’. Whilst this may not have been particularly original, it was certainly most apposite. The pair hooked in to the full power of each gust and in each of the three races to extend a very considerable lead over the rest of a high class fleet, winning by a good margin. Neil Platt and Mark Somerville from the home club put in a strong, consistent performance to finish second in both of the opening races with Terry Crumpton and Roger Errington from Derwent Reservoir in third on both occasions. The wind freshened during the course of the second race. Mike Moore and Micheala Sheard from Bass were second round the windward mark, closely followed by Commodore Steve Kirkpatrick and Keith Thomas also from Bass. The two boats had gone right up the first beat and found a great shift to take them to the front of the fleet. By the end of the race Steve and Keith managed to get past Mike and Michaela but by this time, unfortunately, they had both suffered various vicissitudes and were the last two boats to finish, in 11th and 12th respectively. For the final race of the day, the squally wind had passed through, but there were still good gusts aplenty. Unusually, on the 2nd lap, Steve Goacher and Phil Evans headed for the wrong mark. They realised in time to take their spinnaker down and reach back, but they had lost most of their lead over Neil Platt/Mark Somerville, who stayed very close to his transom for the rest of the race. Terry Crumpton and Roger Errington from Derwent Reservoir finished in third. The sailors were grateful, after their exertions to relax and enjoy half an hour of wine tasting, courtesy of the series sponsor, Waples Wines. 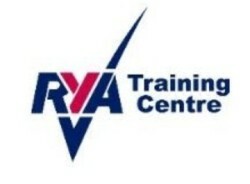 Conditions on Sunday were, as expected, less demanding, allowing some different sailors to prosper. Race 4 started to time at 11:30 and the race began in a pleasant F2-3 breeze from the SSE. However, during the course of a long first beat the wind slackened and became more ‘localised’. The ability to spot bands of wind on different parts of the course paid dividends – if you were able to reach them before they evaporated. It is a measure of the fickle nature of the breeze that Steve Goacher failed to round the windward mark first, although he had led half way up the leg. In the end Steve rounded 4th and appeared to lose several places by failing to bear away onto the reach. There was, of course, method in his madness and he had spotted more breeze arriving further across the course. When he reached the new breeze he bore away and eventually rounded the next mark in the lead. Steve and Phil went on to win the race with John Hardisty and John Mathie, who found the lighter conditions to their liking, in second. Simon Longstaff and John Denwood from the home club recorded a third, their best result of the weekend. In the final race Steve Goacher and Phil Evans again showed that they are in a different class, winning the race and taking the title with a perfect score line of 5 first places. John Hardisty and Roger Errington were second, which secured second place overall. Graham Massey and Russel Clark saved their best ’til last, finishing in third place. 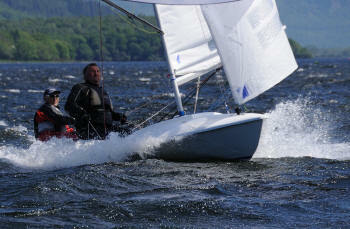 Terry Crumpton and John Mathie sailed a very consistent series to finish third overall. Fourth overall and best Bass boat was Neil Platt and Mark Somerville, who revelled in the stronger breezes but found the lighter winds on the second day more challenging. 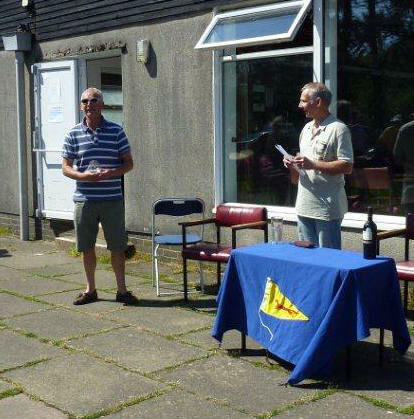 At the prize giving Steve Goacher said, on behalf of all the visitors, that the organisation of the whole event both on and off the water, and the quality of the sailing, demonstrated exactly why visitors always returned to Bass SC.